13th and 14th C. church with a Squire's pew (Mad Jack Fuller) and a 18th C. west gallery on Roman Doric columns, with a barrel organ, also given by Mad Jack, which was refurbished in the year 2000. Mad Jack's pyramid tomb in churchyard. Basically a 13th century church, but with 14th century additions, it has had one or two rich benefactors over the years. For a country church it is therefore larger than than expected. 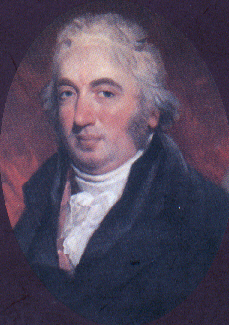 One of the benefactors was Jack Fuller, the most famous of the old Sussex iron masters, who lived nearby in the Manor house. Mad Jack, as he was called (also Honest John), was generous master, and employed the local agricultural force when out of work in constructing the many miles of stone walls which surrounded his estate, and also the many obelisks and follies which can be seen in and around the land he owned. 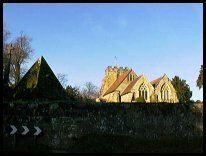 Once challenged to a wager that he could not see Dallington church from the Manor House, he had built a replica of Dallington church spire at the furthest point at which he could see clearly from his house. That "spire" still exists today. He built the west gallery in the church, and is reputed to have given the quire nine bassoons with which to accompany the Psalmody of the period. He subsequently gave the barrel organ which has recently been refurbished (1999), and which stands in the centre of the gallery. The churchyard contains his pyramidal tomb (see picture above), some 25 ft high, in which he is reputed to have been buried sitting up, wearing his hat and with a bottle of port. In 1820 Fuller commissioned W A A. Nicholls to make the barrel organ, which is the largest of its kind in Britain still in full working order. 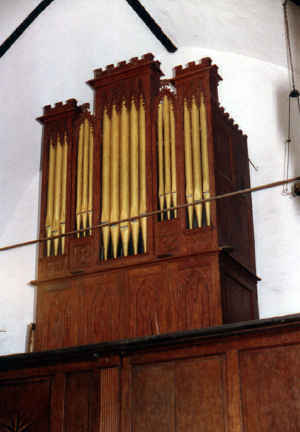 This replaced an earlier organ which went to New Zealand and was preserved in a museum. A gallery to support it was also funded by Fuller. The firm of Harrison & Harrison did restoration work on the organ in 1960 and 1964. The organ was more recently restored in 1999 by Stuart Stobbs and Domenic Gwynn of the firm Martin Goetze and Dominic Gwynn, Worksop, Nottinghamshire. For further details of the refurbished organ, link here. "In preparation for a visit by the bishop Fuller refurbished the interior of the church by boxing in and plastering the walls of the nave and chancel and painting them with whitewash. Unfortunately, in his enthusiasm, he painted over some of the extremely rare wall paintings which adorned the church. They were rediscovered in 1966." Brightling, E Sussex, S Thomas of Canterbury (GF), 8, 12-1-9 in F#. Fuller had the five bells in the church's tower recast and a new treble added. The inscription reads: "The five bells recast and a new treble added at the expense of John Fuller Esq, late member for this county . Anno Domini 1815. In honour of the illustrious Duke of Wellington, his last six victories are here recorded". Two bells were given in 1818, inscribed 'Waterloo', so making a peal of eight. One of these was inscribed "This peal of bells was completed Anno Domini 1818 at the expense of John Fuller Esq."